! !NEW VERSION OF THIS PROJECT HERE!! Hi, I have decided to create a blog page to help if you have a similar project in mind. I am part of a model flying club and for years we have had to guess and hope the weather was right to fly. Some people have to travel a long way to find that its too windy or the wind is going the wrong way. I have built a weather station that has wind sensors and sends the information from these sensors to a website where the other club members can see the weather conditions at the field. 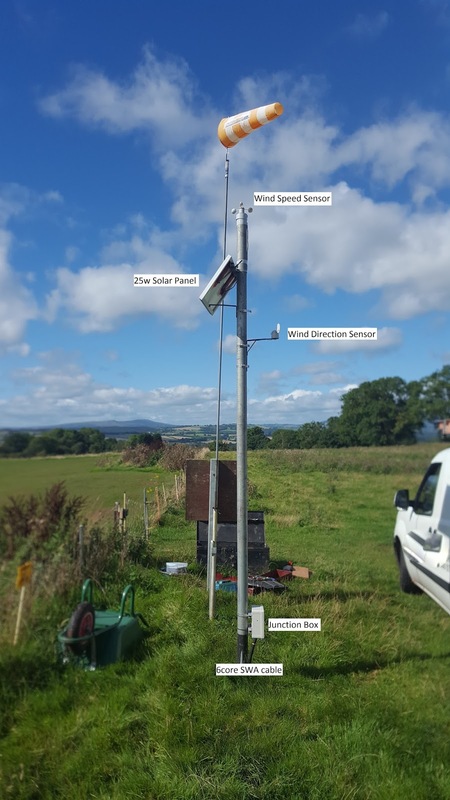 There is no mains electricity or internet connection so the system has to be self sufficient. There is a solar panel on site that runs the electric fence (animals not people) so there is a 12v supply there. This Mega is the master. 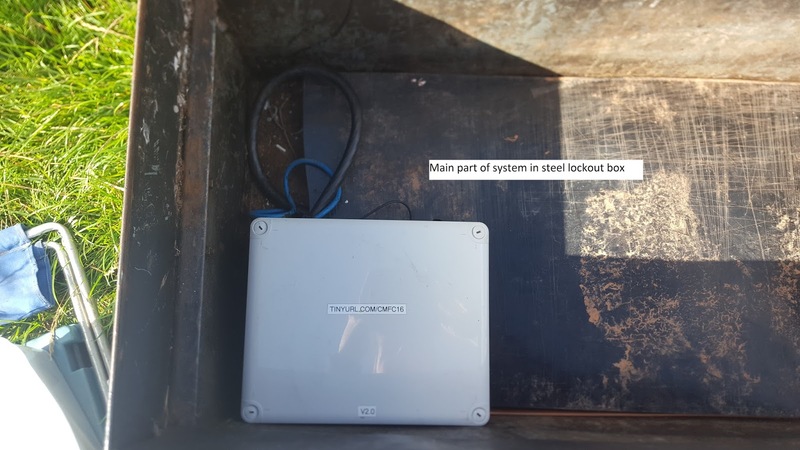 Its job is to collect information from the sensors and send this over the GSM network, using the SIM900 board, to a website called dweet.io. There is a slave Arduino, connected to the master using I2C. This is a bit like a USB cable for machines. The slaves's job is to calculate wind speed and send this, when asked, to the Master. The slave also resets the Master board every 1.5 hours. This is because I have had some issues where there are no updates being sent and this solved that somehow. The SIM900 board is the Master's connection to the internet. The master has to send AT commands over a virtual serial port. The wind sensor is just a reed switch that closes when the magnet passes it. Wire it as above with a 4k7 ohm resistor or as close as you can get. This will keep 5v on digital pin 2 on the Uno until the switch is activated and then 0v for a split second. Love this build - I'm going to recreate your project for my local flying field. One question though, what mechanism/method are you using to tell if anyone is flying at the field? Also, have you considered integrating a web cam for periodic photos? Thanks so much for the awesome project! 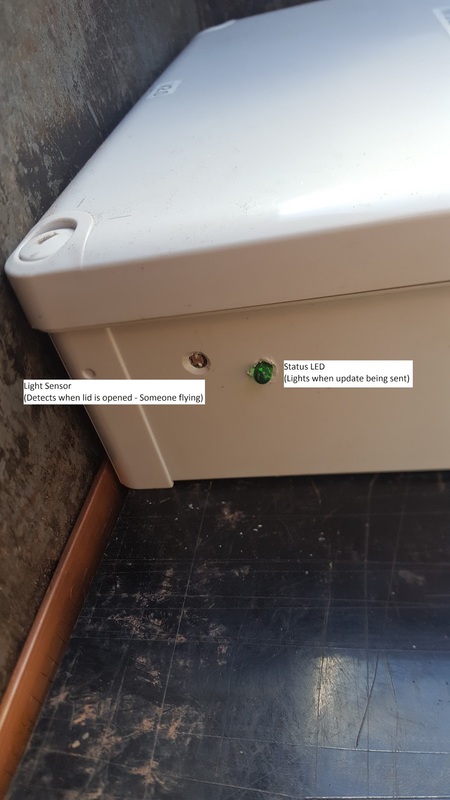 The 'Is someone flying' light is triggered by opening the lockout box at the site. The other members usually fly with it open after signing in. I have had a quick look at a web cam but it looks a bit beyond me at the moment. I'll try and update this asap with the new wiring and code. 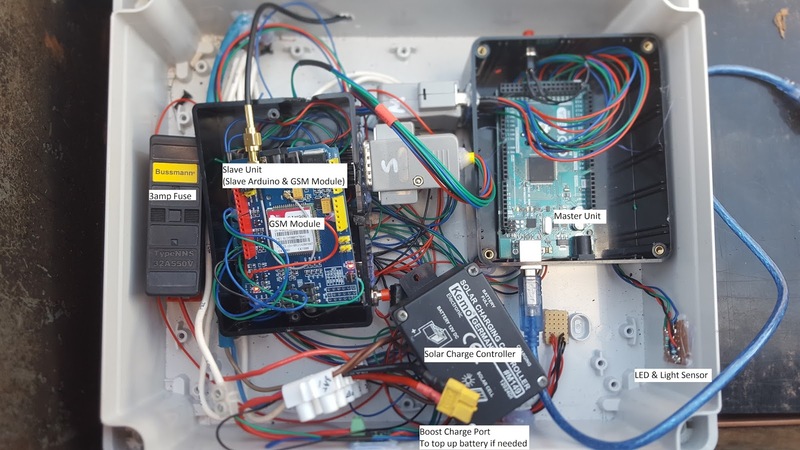 Hello, I also wants recreate this project but I have a problem with the Shield GSM power.GSM need until 2A.How do you do?.You have only battery and panel solar?, but what battery and solar panel you have used for this project for cover the power of GSM?